Once more I decided to tackle the issue of making crafting as easy as possible for the player. I noticed in my own play testing that simply checking enchanting or crafting requirements from each recipe could be a laborious process ... or at the very least hard to keep track. The Scroll supports every OC crafting system, but with some heavy improvements to make crafting much simpler. To help differentiate between the various OC systems, I now simply refer to the "ANCIENT" (uses molds and essences) and "MODERN" (uses recipes) systems. I don't intend to use this post to speak about the various differences between the two systems, but to announce how I have made further improvements to the "MODERN" recipe system. The initial improvement I made to this system was to make gathering recipes easier by automatically placing each recipe into its appropriate recipe book for ease of reference. However, I have now taken this automatic help one stage further by having intelligent feedback from each book and its contents. When a player now hovers their mouse over one of these recipe books, it will give feedback about the recipe pages that are collected within it and whether the party meet the main criteria to use each recipe contained therein. 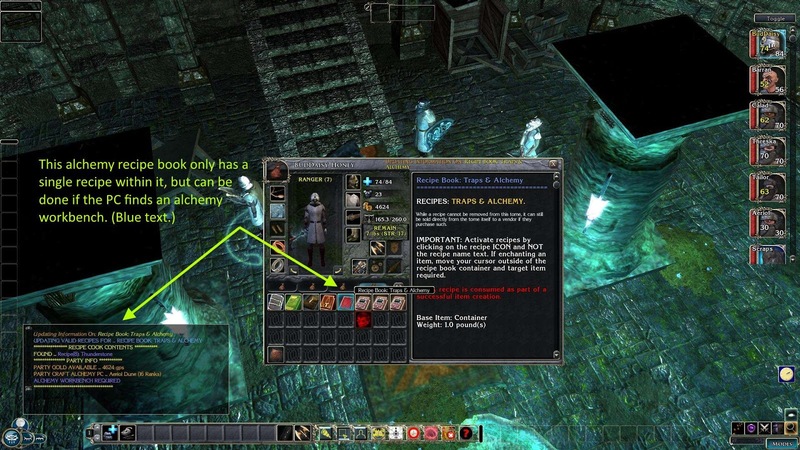 This information is sent to the chat window without the player even needing to open the book if they choose not to. 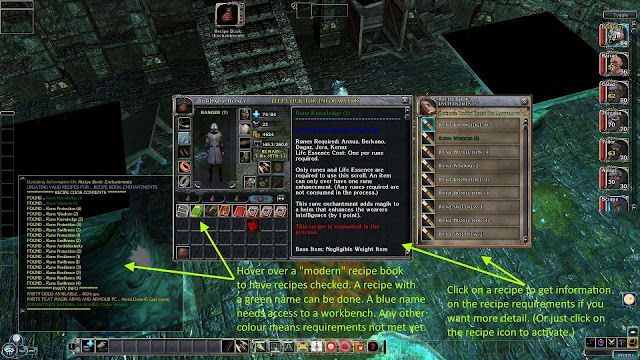 At a glance, the player will now know what recipes each book contains, and by the colour of the name used, be able to tell if they can immediately use the modern recipe (green font), or need a workbench to complete the task (blue font), or be unable to use it at this time (default font). Furthermore, additional party information is given with respect to the skills and feats being required/used, the gold the party carries and whether they have an Enchanter's Satchel to use in place of a Magician's Workbench. If, after all this initial information, the player wants further information (e.g. What exactly are they missing? 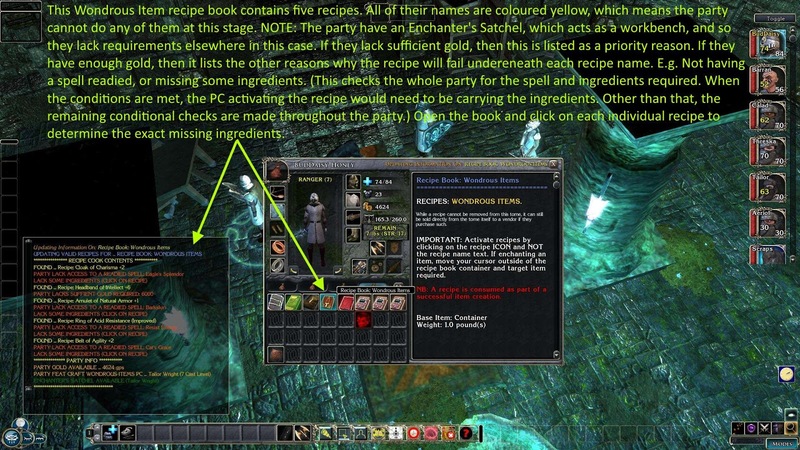 ), then they can simply open the book and read the recipe requirements after clicking on its page. Or ... if they left click on the icon to try to activate the recipe, that will also give detailed feedback about what is missing/required. Enchantment Recipe Book - With New Rune Enchantments! Alchemy Recipe Book - A Single Page Remains! Wondrous Items Recipe Book - Many Potentials Await! Armour Recipe Book - All Used!